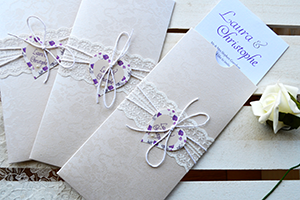 Cheque Book wedding invitations with inserts; Invitation, RSVP, Information, Menu, Accomodation. Silver Heart Weddings, stationery, Huddersfield, West Yorkshire, Yorkshire, order online, hand made creations, unique designs. 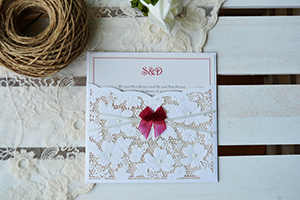 Our Wallet style invitations are elegant and practical. 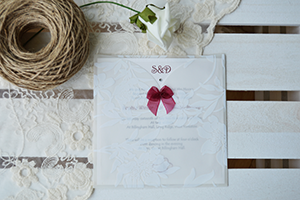 They are made from top quality card stock in a variety of finishes from Kraft to floral pattered vellum. Colour schemes are flexible in most of the designs and the number of inserts is variable in some designs, enabling you to have all of your guests' information together in one handy wallet! Click on the images below to see more about each wallet invitation. Silver Heart provide services to: Huddersfield,Leeds,Bradford,Otley,Wakefield,Halifax,Dewsbury,Pudsey, Pontefract,Brighouse,Shipley,Ilkley, Todmorden,Wetherby, Castleford, and the rest of the UK.